"Even Orwell And Huxley Couldn't Imagine The Threat Posed By Facebook And Google"
In addition to warning that U.S. President Donald Trump represents an immense “danger” to civilization, billionaire George Soros used the spotlight of the World Economic Forum in Davos, Switzerland on Thursday to urge the international community to take seriously the threats posed by Facebook and Google, which he said could ultimately spawn “a web of totalitarian control” if they are not reined in. Such “unholy marriages” could result in a strain of authoritarianism “the likes of which not even Aldous Huxley or George Orwell could have imagined,” the billionaire investor cautioned. Soros went on to compare the tech giants’ impact on the internet - and social media in particular - to the effects of fossil fuel giants on the environment. “They claim they are merely distributing information,” Soros added of the tech giants that are frequently denounced by critics of corporate power for abusing their market dominance. If tech companies are permitted to retain overwhelming control over information, “far-reaching adverse consequences on the functioning of democracy” could result, Soros concluded. “The power to shape people’s attention is increasingly concentrated in the hands of a few companies,” Soros said. 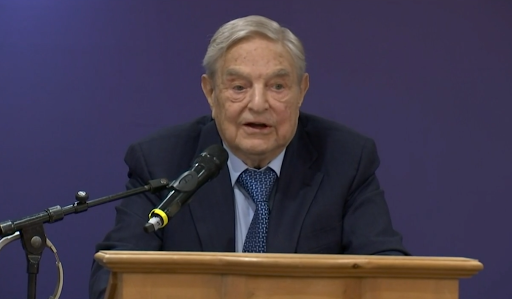 Below is a short clip of Soros’s speech. Good evening. It has become something of an annual Davos tradition for me to give an overview of the current state of the world. I was planning half an hour for my remarks and half an hour for questions, but my speech has turned out to be closer to an hour. I attribute this to the severity of the problems confronting us. After I’ve finished, I’ll open it up for your comments and questions. So prepare yourselves. I find the current moment in history rather painful. Open societies are in crisis, and various forms of dictatorships and mafia states, exemplified by Putin’s Russia, are on the rise. In the United States, President Trump would like to establish a mafia state but he can’t, because the Constitution, other institutions, and a vibrant civil society won’t allow it. Whether we like it or not, my foundations, most of our grantees and myself personally are fighting an uphill battle, protecting the democratic achievements of the past. My foundations used to focus on the so-called developing world, but now that the open society is also endangered in the United States and Europe, we are spending more than half our budget closer to home because what is happening here is having a negative impact on the whole world. But protecting the democratic achievements of the past is not enough; we must also safeguard the values of open society so that they will better withstand future onslaughts. Open society will always have its enemies, and each generation has to reaffirm its commitment to open society for it to survive. The best defense is a principled counterattack. The enemies of open society feel victorious and this induces them to push their repressive efforts too far, this generates resentment and offers opportunities to push back. That is what is happening in places like Hungary today. I used to define the goals of my foundations as “defending open societies from their enemies, making governments accountable and fostering a critical mode of thinking”. But the situation has deteriorated. Not only the survival of open society, but the survival of our entire civilization is at stake. The rise of leaders such as Kim Jong-Un in North Korea and Donald Trump in the US have much to do with this. Both seem willing to risk a nuclear war in order to keep themselves in power. But the root cause goes even deeper. Mankind’s ability to harness the forces of nature, both for constructive and destructive purposes, continues to grow while our ability to govern ourselves properly fluctuates, and it is now at a low ebb. The threat of nuclear war is so horrendous that we are inclined to ignore it. But it is real. Indeed, the United States is set on a course toward nuclear war by refusing to accept that North Korea has become a nuclear power. This creates a strong incentive for North Korea to develop its nuclear capacity with all possible speed, which in turn may induce the United States to use its nuclear superiority preemptively; in effect to start a nuclear war in order to prevent nuclear war – an obviously self-contradictory strategy. The fact is, North Korea has become a nuclear power and there is no military action that can prevent what has already happened. The only sensible strategy is to accept reality, however unpleasant it is, and to come to terms with North Korea as a nuclear power. This requires the United States to cooperate with all the interested parties, China foremost among them. Beijing holds most of the levers of power against North Korea, but is reluctant to use them. If it came down on Pyongyang too hard, the regime could collapse and China would be flooded by North Korean refugees. What is more, Beijing is reluctant to do any favors for the United States, South Korea or Japan– against each of which it harbors a variety of grudges. Achieving cooperation will require extensive negotiations, but once it is attained, the alliance would be able to confront North Korea with both carrots and sticks. The sticks could be used to force it to enter into good faith negotiations and the carrots to reward it for verifiably suspending further development of nuclear weapons. The sooner a so-called freeze-for-freeze agreement can be reached, the more successful the policy will be. Success can be measured by the amount of time it would take for North Korea to make its nuclear arsenal fully operational. I’d like to draw your attention to two seminal reports just published by Crisis Group on the prospects of nuclear war in North Korea. The other major threat to the survival of our civilization is climate change, which is also a growing cause of forced migration. I have dealt with the problems of migration at great length elsewhere, but I must emphasize how severe and intractable those problems are. I don’t want to go into details on climate change either because it is well known what needs to be done. We have the scientific knowledge; it is the political will that is missing, particularly in the Trump administration. Clearly, I consider the Trump administration a danger to the world. But I regard it as a purely temporary phenomenon that will disappear in 2020, or even sooner. I give President Trump credit for motivating his core supporters brilliantly, but for every core supporter, he has created a greater number of core opponents who are equally strongly motivated. That is why I expect a Democratic landslide in 2018. My personal goal in the United States is to help reestablish a functioning two-party system. This will require not only a landslide in 2018 but also a Democratic Party that will aim at non-partisan redistricting, the appointment of well-qualified judges, a properly conducted census and other measures that a functioning two-party system requires. I want to spend the bulk of my remaining time on another global problem: the rise and monopolistic behavior of the giant IT platform companies. These companies have often played an innovative and liberating role. But as Facebook and Google have grown into ever more powerful monopolies, they have become obstacles to innovation, and they have caused a variety of problems of which we are only now beginning to become aware. Companies earn their profits by exploiting their environment. Mining and oil companies exploit the physical environment; social media companies exploit the social environment. This is particularly nefarious because social media companies influence how people think and behave without them even being aware of it. This has far-reaching adverse consequences on the functioning of democracy, particularly on the integrity of elections. The distinguishing feature of internet platform companies is that they are networks and they enjoy rising marginal returns; that accounts for their phenomenal growth. The network effect is truly unprecedented and transformative, but it is also unsustainable. It took Facebook eight and a half years to reach a billion users and half that time to reach the second billion. At this rate, Facebook will run out of people to convert in less than 3 years. 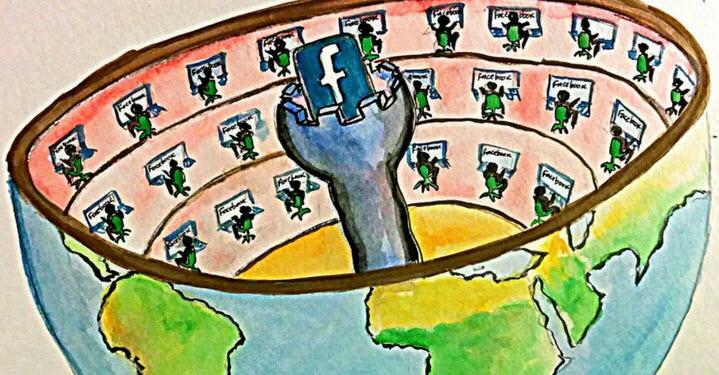 Facebook and Google effectively control over half of all internet advertising revenue. To maintain their dominance, they need to expand their networks and increase their share of users’ attention. Currently they do this by providing users with a convenient platform. The more time users spend on the platform, the more valuable they become to the companies. Content providers also contribute to the profitability of social media companies because they cannot avoid using the platforms and they have to accept whatever terms they are offered. The exceptional profitability of these companies is largely a function of their avoiding responsibility for– and avoiding paying for– the content on their platforms. They claim they are merely distributing information. But the fact that they are near- monopoly distributors makes them public utilities and should subject them to more stringent regulations, aimed at preserving competition, innovation, and fair and open universal access. The business model of social media companies is based on advertising. Their true customers are the advertisers. But gradually a new business model is emerging, based not only on advertising but on selling products and services directly to users. They exploit the data they control, bundle the services they offer and use discriminatory pricing to keep for themselves more of the benefits that otherwise they would have to share with consumers. This enhances their profitability even further – but the bundling of services and discriminatory pricing undermine the efficiency of the market economy. Social media companies deceive their users by manipulating their attention and directing it towards their own commercial purposes. They deliberately engineer addiction to the services they provide. This can be very harmful, particularly for adolescents. There is a similarity between internet platforms and gambling companies. Casinos have developed techniques to hook gamblers to the point where they gamble away all their money, even money they don’t have. Something very harmful and maybe irreversible is happening to human attention in our digital age. Not just distraction or addiction; social media companies are inducing people to give up their autonomy. The power to shape people’s attention is increasingly concentrated in the hands of a few companies. It takes a real effort to assert and defend what John Stuart Mill called “the freedom of mind.” There is a possibility that once lost, people who grow up in the digital age will have difficulty in regaining it. This may have far-reaching political consequences. People without the freedom of mind can be easily manipulated. This danger does not loom only in the future; it already played an important role in the 2016 US presidential elections. But there is an even more alarming prospect on the horizon. There could be an alliance between authoritarian states and these large, data-rich IT monopolies that would bring together nascent systems of corporate surveillance with an already developed system of state-sponsored surveillance. This may well result in a web of totalitarian control the likes of which not even Aldous Huxley or George Orwell could have imagined. The countries in which such unholy marriages are likely to occur first are Russia and China. The Chinese IT companies in particular are fully equal to the American ones. They also enjoy the full support and protection of the Xi Jingping regime. The government of China is strong enough to protect its national champions, at least within its borders. US-based IT monopolies are already tempted to compromise themselves in order to gain entrance to these vast and fast growing markets. The dictatorial leaders in these countries may be only too happy to collaborate with them since they want to improve their methods of control over their own populations and expand their power and influence in the United States and the rest of the world. The owners of the platform giants consider themselves the masters of the universe, but in fact they are slaves to preserving their dominant position. It is only a matter of time before the global dominance of the US IT monopolies is broken. Davos is a good place to announce that their days are numbered. Regulation and taxation will be their undoing and EU Competition Commissioner Vestager will be their nemesis. There is also a growing recognition of a connection between the dominance of the platform monopolies and the rising level of inequality. The concentration of share ownership in the hands of a few private individuals plays some role but the peculiar position occupied by the IT giants is even more important. They have achieved monopoly power but at the same time they are also competing against each other. They are big enough to swallow start-ups that could develop into competitors, but only the giants have the resources to invade each other’s territory. They are poised to dominate the new growth areas that artificial intelligence is opening up, like driverless cars. The impact of innovations on unemployment depends on government policies. The European Union and particularly the Nordic countries are much more farsighted in their social policies than the United States. They protect the workers, not the jobs. They are willing to pay for re-training or retiring displaced workers. This gives workers in Nordic countries a greater sense of security and makes them more supportive of technological innovations than workers in the US. The internet monopolies have neither the will nor the inclination to protect society against the consequences of their actions. That turns them into a menace and it falls to the regulatory authorities to protect society against them. In the US, the regulators are not strong enough to stand up against their political influence. The European Union is better situated because it doesn’t have any platform giants of its own. The European Union uses a different definition of monopoly power from the United States. US law enforcement focuses primarily on monopolies created by acquisitions, whereas EU law prohibits the abuse of monopoly power irrespective of how it is achieved. Europe has much stronger privacy and data protection laws than America. Moreover, US law has adopted a strange doctrine: it measures harm as an increase in the price paid by customers for services received – and that is almost impossible to prove when most services are provided for free. This leaves out of consideration the valuable data platform companies collect from their users. Commissioner Vestager is the champion of the European approach. It took the EU seven years to build a case against Google, but as a result of her success the process has been greatly accelerated. Due to her proselytizing, the European approach has begun to affect attitudes in the United States as well. I have mentioned some of the most pressing and important problems confronting us today. In conclusion, let me point out that we are living in a revolutionary period. All our established institutions are in a state of flux and in these circumstances both fallibility and reflexivity are operating at full force. I lived through similar conditions in my life, most recently some thirty years ago. That is when I set up my network of foundations in the former Soviet empire. The main difference between the two periods is that thirty years ago the dominant creed was international governance and cooperation. The European Union was the rising power and the Soviet Union the declining one. Today, however, the motivating force is nationalism. Russia is resurgent and the European Union is in danger of abandoning its values. As you will recall, the previous experience didn’t turn out well for the Soviet Union. The Soviet empire collapsed and Russia has become a mafia state that has adopted a nationalist ideology. My foundations did quite well: the more advanced members of the Soviet empire joined the European Union. Now our aim is to help save the European Union in order to radically reinvent it. The EU used to enjoy the enthusiastic support of the people of my generation, but that changed after the financial crisis of 2008. The EU lost its way because it was governed by outdated treaties and a mistaken belief in austerity policies. What had been a voluntary association of equal states was converted into a relationship between creditors and debtors where the debtors couldn’t meet their obligations and the creditors set the conditions that the debtors had to meet. That association was neither voluntary nor equal. As a consequence, a large proportion of the current generation has come to regard the European Union as its enemy. One important country, Britain, is in the process of leaving the EU and at least two countries, Poland and Hungary, are ruled by governments that are adamantly opposed to the values on which the European Union is based. They are in acute conflict with various European institutions and those institutions are trying to discipline them. In several other countries anti-European parties are on the rise. In Austria, they are in the governing coalition and the fate of Italy will be decided by the elections in March. How can we prevent the European Union from abandoning its values? We need to reform it at every level: at the level of the Union itself, at the level of the member states and the level of the electorate. We are in a revolutionary period; everything is subject to change. The decisions taken now will determine the shape of the future. At the Union level, the main question is what to do about the euro. Should every member state be required to eventually adopt the euro or should the current situation be allowed to continue indefinitely? The Maastricht Treaty prescribed the first alternative but the euro has developed some defects that the Maastricht Treaty didn’t foresee and still await resolution. Should the problems of the euro be allowed to endanger the future of the European Union? I would strongly argue against it. The fact is that the countries that don’t qualify, are eager to join, but those that do qualify have decided against it, with the exception of Bulgaria. In addition, I would like to see Britain remain a member of the EU or eventually rejoin it and that couldn’t happen if it meant adopting the euro. The choice confronting the EU could be better formulated as one between a multi-speed and a multi-track approach. In a multi-speed approach, member states have to agree in advance on the ultimate outcome; in a multi-track approach, member states are free to form coalitions of the willing to pursue particular goals on which they agree. The multi-track approach is obviously more flexible but the European bureaucracy favored the multi-speed approach. That was an important contributor to the rigidity of the EU’s structure. At the level of the member states, their political parties are largely outdated. The old distinction between left and right is overshadowed by being either pro or anti-European. This manifests itself differently in different countries. In Germany, the Siamese twin arrangement between the CDU and the CSU has been rendered unsustainable by the results of the recent elections. There is another party, the AfD further to the right than the CSU in Bavaria. This has forced the CSU to move further to the right in anticipation of next year’s local elections in Bavaria so that the gap between the CSU and the CDU has become too great. This has rendered the German party system largely dysfunctional until the CDU and CSU break up. In Britain, the Conservatives are clearly the party of the right and Labor the party of the left, but each party is internally divided in its attitude toward Brexit. This complicates the Brexit negotiations immensely, and makes it extremely difficult for Britain as a country to decide and modify its position towards Europe. Other European countries can be expected to undergo similar realignments with the exception of France, which has already undergone its internal revolution. At the level of the electorate the top-down initiative started by a small group of visionaries led by Jean Monnet carried the process of integration a long way but it has lost its momentum. Now we need a combination of the top-down approach of the European authorities with the bottom-up initiatives started by an engaged electorate. Fortunately, there are many such bottom-up initiatives; it remains to be seen how the authorities will respond to them. So far President Macron has shown himself most responsive. He campaigned for the French presidency on a pro-European platform and his current strategy focuses on the elections for the European Parliament in 2019 – and that requires engaging the electorate. While I have analyzed Europe in greater detail, from a historical perspective what happens in Asia is ultimately much more important. China is the rising power. There were many fervent believers in the open society in China who were sent to be re-educated in rural areas during Mao’s Revolution. Those who survived returned to occupy positions of power in the government. So the future direction of China used to be open-ended; but no more. The promoters of open society have reached retirement age and Xi Jinping, who has more in common with Putin than with the so-called West, has begun to establish a new system of party patronage. I’m afraid that the outlook for the next twenty years is rather bleak. Nevertheless, it is important to embed China in institutions of global governance. This may help to avoid a world war that would destroy our entire civilization. That leaves the local battlegrounds in Africa, the Middle East and Central Asia. My foundations are actively engaged in all of them. We are particularly focused on Africa, where would-be dictators in Kenya, Zimbabwe and the Democratic Republic of Congo have perpetrated electoral fraud on an unprecedented scale and citizens are literally risking their lives to resist the slide into dictatorship. Our goal is to empower local people to deal with their own problems, assist the disadvantaged and reduce human suffering to the greatest extent possible. This will leave us plenty to do well beyond my lifetime.